This has been one of my favorite quotes for at least 10 year. It's SO TRUE! 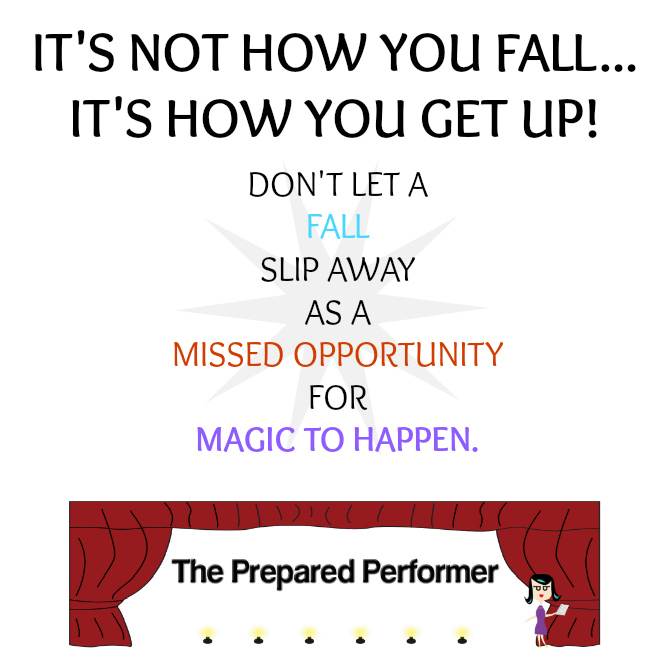 Especially in auditions or while performing. One of my favorite things to discover is moments that people have taken in their lives to turn what could be a negative into a positive. Well, yesterday a friend told me about the video I've posted below. It's a perfect example of how to turn a negative into a positive. And, it's pretty dang funny. Musician Dave Carroll said his guitar was broken while in United Airlines' custody. After seeing employees throw his guitar from his plane window… He arrived at his destination to discover that his $3,500 Taylor guitar was severely damaged. After spending months trying to get help… he was turned away with no answer. This is his response… which gave him quite a bit of publicity. DISCLAIMER – I have no issues with United Airlines… I just think this is was a super creative way focus on GETTING UP rather than FALLING.